Granted, in a pinch, and with a little imagination, near enough anything can be a salad bowl. But we think proper get-togethers and signature recipes deserve something a little more special, don’t you? Our best salad bowls are the optimum size and shape for presenting your wonderful Waldorf, knockout Niçoise or piles of luscious leaves, meaning no “whoops!” moments – you know the ones: the coleslaw overflows, the getting caught chasing that last cherry tom around an awkwardly shaped vessel – just a really good-looking tablescape. Working with a small kitchen with no room in the cupboard for another serving bowl? No fear, these salad bowls are made to be showed off. From elegant glass to postmodern steel, summer-ready ceramics to classic solid wood, there’s something for every style, and each one looks just as good on the sideboard as it does filled with enticing nibbles. Those materials aren’t just there to look cool though, and just as with the rest of your tableware, each one has its merits. 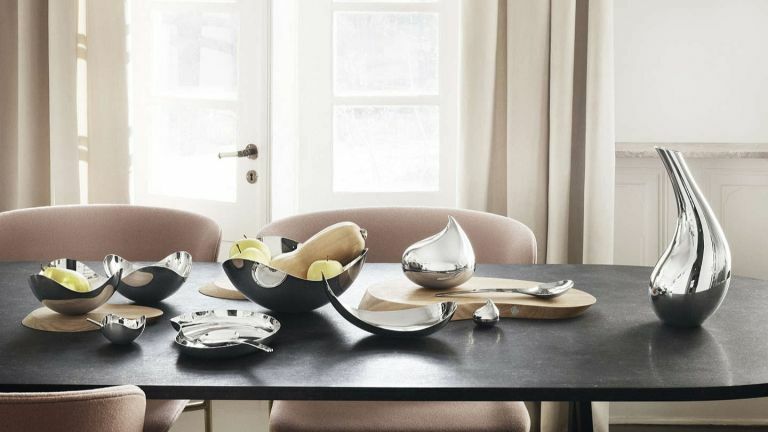 Stainless steel, as found in the Georg Jensen Bloom series and metal hammered bowl by Aulica, is as tough as it is beautiful and engineered to last a long time. Wooden salad bowls like our Ash Wood bowl from Marks & Spencer look wonderful with just a quick wipe to clean, but, like Gremlins, they should never be introduced to water, as their porous nature means they’ll swell, potentially resulting in cracks and splits. Then there are the low-maintenance all-stars on our list: the ceramic and thermoplastic resin bowls that can happily be popped in the dishwasher. Who doesn’t love easy clean-up? While all of our picks are good-looking in their own way, the Georg Jensen Bloom bowl easily takes our top spot with its elegant design. Part salad server, part art piece, it uses bold sweeping lines and a knockout reflective finish to create the ultimate centrepiece for special occasions. Reviewers found it surprisingly lightweight despite its durable stainless steel construction, meaning you won’t struggle carrying it to the table for that final flourish. Beautiful and practical, it’s a real investment piece, and our best salad bowl all-round. We can’t promise that this hammered metal salad bowl by Aulica at Wayfair will make the sun come out of hiding, but it’ll certainly bring a touch of the Moroccan riad to your table, even if the barbecue’s sadly rained off. As well as looking pretty – all thanks to that artisanal-look dimpled finish – it’s built of strong stuff (stainless steel, to be precise) meaning it’s built to take years of enthusiastically oiled salads in its stride. This elegant salad bowl is simplicity itself, a combo of clean lines, smart glass and natural finished beech wood that suits all sorts of schemes. The mark-free base means you needn’t worry about it scratching any surfaces, so you can put it to work serving up pre-dinner snacks on the coffee table as well as popping it in the middle of a buffet spread, although if you like a bit of versatility in your tableware, you can also forego the removable wood for an even more pared-back look. Fans of quirky kitchen brands like Joseph Joseph and Alessi will find a lot to love about the Shadow Salad Bowl by Koziol at Wayfair – not least the pocket-friendly price. The meeting of desirable design and practicality makes it perfect for showing off at parties without any compromise, with an appealing curvy shape forged from easy-clean materials. As well as coming with a set of servers, this bowl boasts clever notches on the rim to keep them where they need to be, so the last one to the buffet table needn’t find themselves fishing around for a mucky-handled spoon. Food’s more fun with a bit of colour, and we think that goes for what it’s served in too. This ceramic salad bowl from John Lewis’ Alfresco collection brings a bright hit of summer to the table, with its colourful geometric print interior and terracotta exterior engineered to set off fresh salads beautifully. Those who’ve bought it and loved it say it’s endlessly versatile, so while it might be the perfect salad bowl for those summer barbecues, don’t let us stop you getting creative with what you put in it! Keep an eye on this wooden salad bowl when your next party rolls around, because we’re pretty sure everyone’s going to want one of their own. It somehow manages to be both timeless and contemporary, with its quality natural material and unexpected dark shade from some of the more standard serving bowl fare. The natural grain of the wood shines through to make a really gorgeous piece, even when it’s not piled high with fabulous food, and what might surprise you most is that reviewers say it’s super easy to clean. Protect your surfaces from vinaigrette overspill with one of our favourite placemat sets.